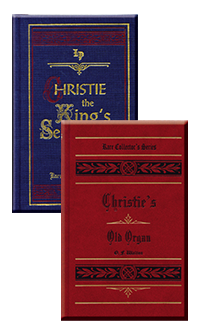 In Christie, the King's Servant, Big Jack finds more at the seashore than a beautiful scene to paint. There is hope for his soul when God brings dear people across his path that were long forgotten. The old barrel organ from Christie’s Old Organ returns in this sequel to draw people together. Jack must choose whether or not he will “cross the line” at the bidding of Christie, the earnest preacher in the little seaside fishing village. The honest, humble people of Runswick Bay will leave an indelible mark on Jack Villiers that will change his life forever. From Kris of Cherry Log, Georgia on 4/29/2013 . Christie the King's Servant: From this book we followed the example and we copied onto bookmarks a verse from Psalms to pray each morning before we begin to read our Bibles. This book series was one of the sweetest stories we have ever read out loud. We bonded together as we read, discussed, cried and laughed. When we were finished reading we passed the books along to a family that just lost their 10 year old daughter to comfort them with a purely tender story. We couldn't be without the two books so we re-ordered them to permanently stay in our 'character library' they are amongst our favorites. Thank you Lamplighter! !